This blog setup guide is all about laying a foundation to increase blog traffic to your blog. It’s part of my 5 part increase blog traffic series. How to Start a Blog: Beginner’s Guide. This post will give you step by step directions. Today I share secret number one: Blog Setup Guide: Laying a Foundation for Blog Traffic. What does this mean? Your blog’s foundation are the pieces that hold your blog up. A strong foundation will help your blog grow and stand the test of time. A weak foundation will leave you frustrated and ready to quit blogging. So what are the key pieces to your blog foundation? Continue reading this blog setup guide to find out. Why is this an important piece in your blog’s foundation? If you are not analyzing your blog and blog traffic; you’ll never know what is working and what isn’t. In order to drive traffic to your blog; you need to focus on what IS working. How to Increase Blog Traffic with Google Analytics. Did you know that if your blog takes more than two seconds to load, there’s a good chance you’ll lose readers? Your blog speed and performance is an important part of your blog’s foundation. A slow blog means less blog traffic. Period. See my post Blog Speed Test | How to Check Your Blog Performance to learn how to check your own blog speed. I also give you suggestions for site improvements, in the event you find out that your blog is slow to load. Hint: there’s a good chance it is. If you want to grow your blog, increase blog traffic, and be seen as an expert in your niche; you must find and use niche specific and relevant keywords throughout your blog and blog posts. This is an extremely important part of your blog’s foundation. Search engines crawl websites and blogs constantly, looking for keywords and good content. If you blog about anything and everything, there is a good chance that search engines will 1. overlook you 2. not know how to rank your content. Help search engines out by focusing on niche specific and relevant keywords. When your blog is full of niche specific and relevant keywords, search engines will start to see you as an expert in that niche. Your posts will start to rank in search engine results, and you’ll see a boost in organic traffic. See my post How to Find Top Ranking Keywords for Your Blog to get started on building this part of your blog’s foundation. We talked about niche specific and relevant keywords above. How you use those keywords is known as SEO. This is another important part of your blog’s foundation. Placing keywords throughout your blog, in a haphazard way, won’t help you increase blog traffic as much as deliberately placing keywords. The keyword here is “deliberate”. To maximize your use of your keywords, you need to know where to place them. See my post 5 Blog SEO Tips: How to Optimize Blog Posts for SEO for tips on how and where to use your keywords. This blog setup guide gave you four important building blocks for your blog’s foundation. 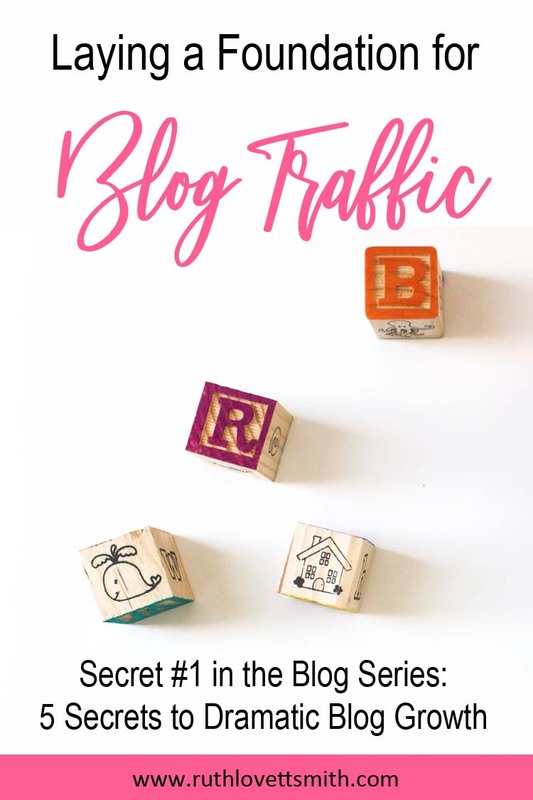 While there are many other steps to building, and strengthening, your blog’s foundation; these four steps are crucial to growing your blog and increasing your blog traffic. 3 Simple Tips to Get Your Blog Noticed.